Over the two days, in addition to receptions, visits to VR labs, and a hike on Mt. Rainier, the participants explored the future of global and human health in four sessions – the future of global human health, the future of planetary health, our future in space in how it relates to planetary health and the future of humans, and finally a session on integrating science fiction, story and new media into futures work. I’ll be posting some lessons from these sessions in the next several days. Here, I will simply highlight a story about the APF that appeared in GeeKWire. 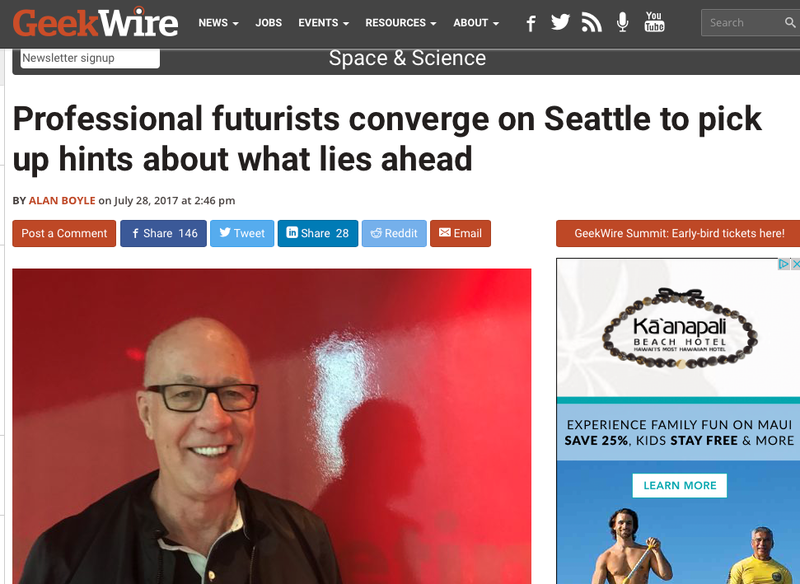 And, Alan Boyle wrote about the prospects for mining asteroids and really creating a space manufacturing civilization after the second day of the APF gathering, on space and on science fiction and new media, in GeekWire, here. In Future, we would be needing more Futurists in every organization. A dedicated profile will be created for social scientist and visionaries. Futurism is becoming one of the greatest phenomena especially because of the rise of Internet and global threat of extinction due to over population and climate change. Things are moving really faster than before hence we need futurist to predict the pros and cons of every move that humanity takes. Just listened to you on How Your World Works. You are “spot on” even when you are not. Do you have a newsletter that goes out.